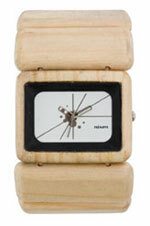 The Vega Wood Nixon Watch. Where stars are born. Movement: Three hand Japanese quartz. Case: Custom 30 meter solid wood with hardened mineral crystal and stainless-steel caseback. Band: Custom one-size solid wood with stretch band.